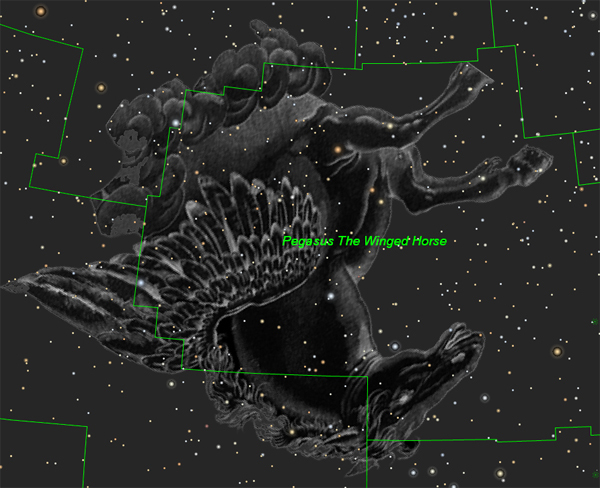 High in the sky as darkness falls is the constellation Pegasus. 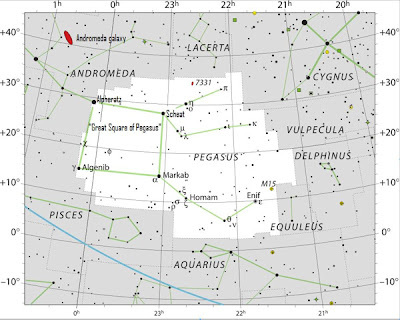 Four stars of nearly equal brightness make up the asterism known as the “Great Square of Pegasus”, Scheat, Alpheratz, Markab and Algenib. The "Great Square" forms the body of the Winged Horse. To connect the rest of Pegasus, you'll need to use the right side of the "square." Pegasus is flying upside down across the sky. From Markab (lower right corner) extends the head of the Winged Horse. 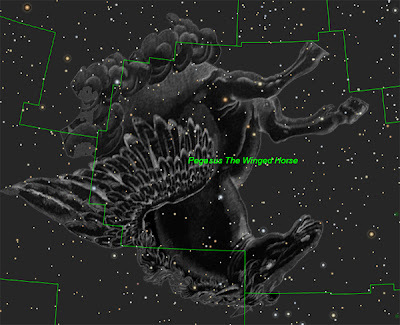 The two front legs of Pegasus can be found off the star Scheat (upper right corner). The star Alpheratz is shared by two constellations, Pegasus and Andromeda. The star is actually considered to be a star of Andromeda. The Babylonian constellation IKU had four stars of which three were later part of the Greek constellation Hippos (Pegasus). Pegasus, in Greek mythology, was a winged horse with magical powers. One myth regarding his powers says that his hooves dug out a spring, Hippocrene, which blessed those who drank its water with the ability to write poetry. Pegasus was the one who delivered Medusa's head to Polydectes, after which he travelled to Mount Olympus in order to be the bearer of thunder and lightning for Zeus. Eventually, he became the horse to Bellerophon, who was asked to kill the Chimera and succeeded with the help of Athena and Pegasus. Despite this success, after thedeath of his children, Bellerophon asked Pegasus to take him to Mount Olympus. Though Pegasusagreed, he plummeted back to Earth after Zeus either threw a thunderbolt to buck him off. In ancient Persia, Pegasus was depicted by al-Sufi as a complete horse facing east, unlike most other uranographers, who had depicted Pegasus as half of a horse, rising out of the ocean. 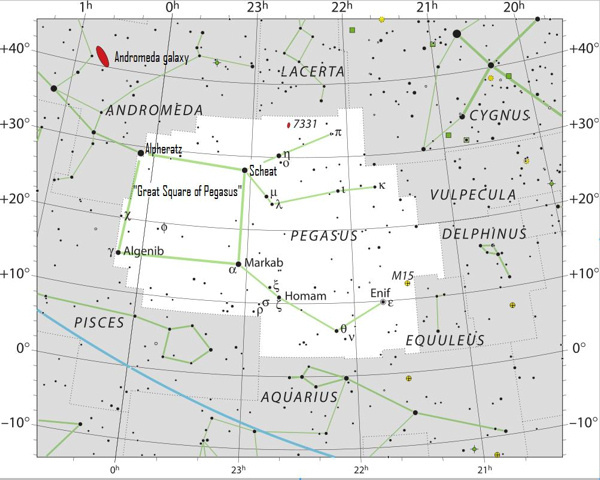 In Hindu astronomy, the Great Square of Pegasus contained the 26th and 27th lunar mansions. More specifically, it represented a bedstead that was a resting place for the Moon. Warrau and Arawak peoples in Guyana used the stars in the Great Square to represent a grill on stilts. Messier 15 or M15 (shown on the illustration above) is a globular cluster in the constellation Pegasus. It was discovered by Jean-Dominique Maraldi in 1746 and included in Charles Messier's catalogue of comet-like objects in 1764. At an estimated 12.0 billion years old, it is one of the oldest known globular clusters. M15 is about 33,600 light-years from Earth, and 175 light years in diameter. It has an absolute magnitude of -9.2, which translates to a total luminosity of 360,000 times that of the Sun. Messier 15 is one of the most densely packed globulars known in the Milky Way galaxy. Its core has undergone a contraction known as 'core collapse' and it has a central density cusp with an enormous number of stars surrounding what may be a central black hole. Home to over 100,000 stars, the cluster is notable for containing a large number of variable stars (112) and pulsars (8), including one double neutron star system, M15 C. M15 also contains Pease 1, the first planetary nebula discovered within a globular cluster in 1928. Just three others have been found in globular clusters since then. Pegasus is also noted for its more unusual galaxies and exotic objects. Einstein's Cross is a quasar that has been lensed by a foreground galaxy. The elliptical galaxy is 400 million light-years away with a redshift of 0.0394, but the quasar is 8 billion light-years away. The lensed quasar resembles a cross because the gravitational force of the foreground galaxy on its light creates four images of the quasar. A quasi-stellar radio source ("quasar") is a very energetic and distant active galactic nucleus. Quasars are extremely luminous and were first identified as being high redshift sources of electromagnetic energy, including radio waves and visible light, that were point-like, similar to stars, rather than extended sources similar to galaxies. While the nature of these objects was controversial until as recently as the early 1980s, there is now a scientific consensus that a quasar is a compact region in the center of a massive galaxy surrounding its central supermassive black hole. Its size is 10–10,000 times the Schwarzschild radius of the black hole. The quasar is powered by an accretion disc around the black hole. Stephan's Quintet is another unique object located in Pegasus. It is a cluster of five galaxies at a distance of 300 million light-years and a redshift of 0.0215. First discovered by Édouard Stephan, a Frenchman, in 1877, the Quintet is unique for its interacting galaxies. Two of the galaxies in the middle of the group have clearly begun to collide, sparking massive bursts of star formation and drawing off long "tails" of stars. Astronomers have predicted that all five galaxies may eventually merge into one large elliptical galaxy.